Where in the World is Steve Today? Members Checking in via "All About the Weekend Chat"
Have fun and let others know you liked their posts... click the stars and mark answers you like as "best". Those posts will be temporarily highlighted by being placed as the first answer in the chat for a while. Members will also receive email notification (unless they opted out) that let them know you liked what they did. At the end of the weekend "best answer" will be removed as all answers are equal in the eyes of the Chat. Click to learn more. It's ok.... go for it! The Weekend Chat is for everyone. It's a place to catch up on what people are up to, and to share what you've been doing. New members can say hello, introduce themselves, ask questions, and meet each other. Our seasoned members can share progress or successes from their projects, give tips and advice, or chime in on hot topics. Post as many answers and comments as you wish. It doesn't hurt anyone to post a lot, and many will enjoy their multitude of reading options. Let's hear what you've been up to this week and what the plans are for the weekend. Tons to do or taking it easy? Hi Keith, thanks for hosting! My Walmart sells two day old bread (italian and French) for fifty cents a loaf. Heat oven to 350ºF. In 2-quart saucepan, heat milk and butter over medium heat until butter is melted and milk is hot. In large bowl, mix eggs, sugar, cinnamon and salt. Stir in bread cubes and raisins. Stir in milk mixture. Pour into ungreased deep round pan. Keith ! Keith ! If you don't want a dessert, add Creole seasoning to the bread pudding instead of cinnamon and crumbly bacon or Hamburg or sausage instead of raisins. Why not make it both ways and have your main course and dessert at the same time? Will pass the recipe on to the lady of the house. This is good stuff. one variation I tried was with green tomatoes layered in with brown sugar. David--R U serious/Sirius? --Main course and dessert of the same type in the same meal? OMG --The trail from infamy is death by overdose! Yes thank you for hosting the weekend chat, Keith and welcome everyone to the weekend chat. First of all Thanks Keith for hosting this weekends g2g chat. This past week was a challenge on Thursday my car of which I nicknamed Ichabod died. Perhaps I should create a profile for it :) Wasn't too bad for 247,000 miles and 17 years old. I reckon I will do 2 answers this week as I didn't get the pictures I wanted to share done from last week so will work on that in a few. 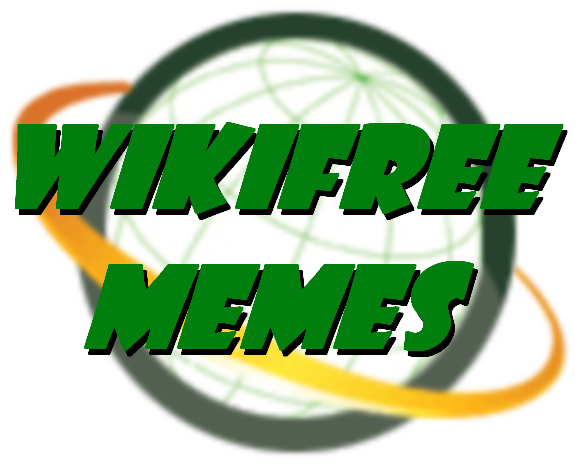 So this past week I did some housekeeping on wikitree and I was going through some of my early creations and I'm like no I didn't create this its horrible but through time I have learned so much and I hope to continue to learn more. When asking questions about people on the forum enter the ID for the profile in the box under the question, this makes it easier for other members to find the right profile and answer you. If the question is about someone without a profile then give as much information as you can in the question, like approximate dates and places, if only a century and a continent, it makes it easier to get the right expert on the job. Great tip as always Steve. I was thinking about you when posting the Chat just moments ago. I almost put a category right under "Eddie's Picks" named "Where in the World is Steve Today?". I always enjoy hearing from you and seeing the pictures you share. I'm inspired to go out and snap a few myself to post later. Enjoy the day my friend! That be fine if you did that I be greatly flattered. Guess your car trouble was catching since Wednesday my truck had problems and with only 120,000 miles on it. Maybe I should add a task to the Integrators for "Where in the World is Steve Today?" Sometimes I wonder where I am. I can sit at the computer all day and accomplish so little. (Oh Shiny Object must look) But I love wikitree. I got you all beat on the car problems. Monday the part should be in to fix my 2016 that has just a very little over 4000 miles on it. I often wonder why I keep making the payments on it and then I remember that I owe more than I could get from selling it. Yes that is the difficult things with vehicles. The moment you take the thing off the lot it is than classified a "USED" vehicle. Right there is at-least 3 to 4k off the price tag. Your second paragraph above, Steve, is so encouraging! Right at this moment of life I feel so burdened that I feel I should give up Wikitree for a few months, get out of whatever mudtraps show up as days go along, and come back to Us with a mind free of the clutter created by needs for perfection and rectitude (right word???). I have been OCD once in my life, but genealogy is not like learning the titles, contents and authors of every American and British major author up thru the early 1960 (so youthful was I then! sigh), so I could teach literature to undergrads. Now my OCD is: have I done my math for the difference in ages between a parent and child and all the other items on my error list, some of which are made by others' trees being added into mine, and some I don't know how to fix. The existential question is, certain or uncertain, which is the more valued task? Or (as I've been doing for years now) is it NOT loading the task with freight or should we simply feel blessed by enjoying the historical-genealogical-DNA proscribed ride! It's a terrific journey through the choreographies of date and time with the joy of inferences which can (and I DO !) fill in an ancestor's whole life story! Hello everyone to the weekend chat. I'm glad I was able to be of encouragement to you. Life can be hard but we not in the battle alone everyone has some tar that attempts to keep them trapped. Keep your chin up. You will succeed. Steve, Duh--could you say the same thing as immediately above in twice as many words, or twice + as many? What do you mean? Who's all geared up for the Source-a-Thon? 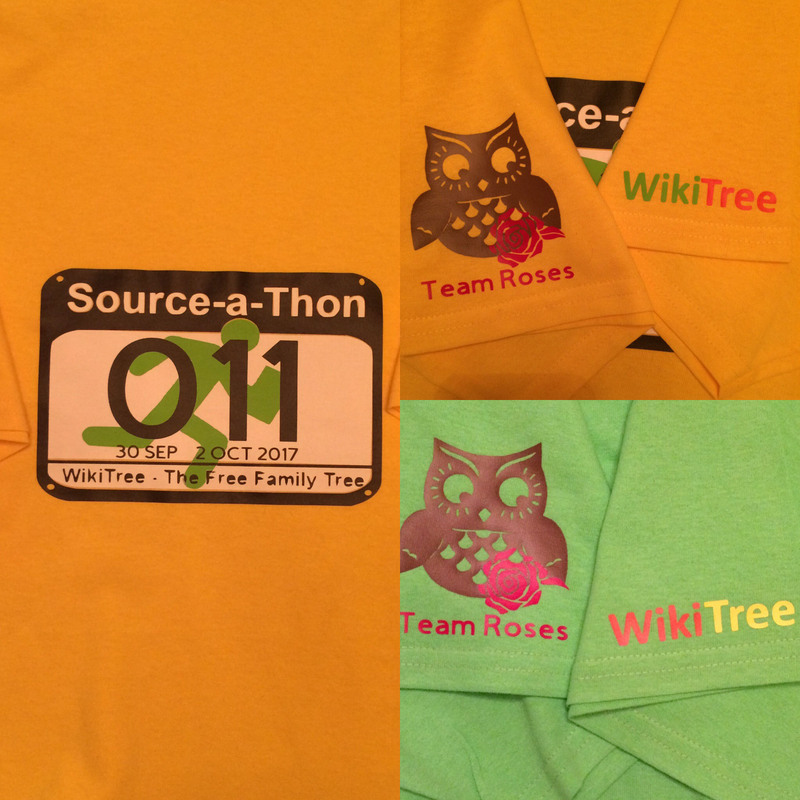 Lynette have your joined the source a thon and what team have you chosen? If you haven't chose a team Team Tennessee would be happy to have you on our team. There is plenty of room on it. Linda, I joined the Southern Super Sweepers under Dorothy Berry and Mary Richardson. Mary and I are on several projects together. Military, Disasters, Southern Colonies, US History States Projects. I'm co-ordinator/manager for Arkansas. Mary for Texas. And she twisted my arm to join. I was on Team Missouri last year. Bea, I just believe it takes more then just a FAG to source. Granted, sometimes thats all we have. I searched for 2 days for a family that was born, married and died in AR and for 50 years otherwise successfully avoided the census taker, other gov'ment men and revenuers. My guess is they are so far back in those hills, no one wants to go back there. Bea, How does one "gear up" for helping people with sources????? I've been doing genealogy for 38 years now.... off and on. My mother and here sister beat me with their cast iron skillets and steel blue-gray eyes that would drill holes thru you. I would not work on their lines because 1. they wouldn't share, and 2. if I did find something, they would pick it apart with a fine tooth comb and shred it 10 ways from sunday. So I did my Dad's lines. I interviewed cousins. Traded info. Wrote a newsletter for 3 years, because I felt all the Jesters were related . I cut my teeth on microfilm and writing down the roll#, page, and lines. And I read each roll numerous times. And now I'm going thru the rolls on familysearch again and transcribing the census. Brown township, Union County, is the best example of what I'm doing. The family I spent 2 days on was in the AR Unsourced page. And now, I'm working on Mom's lines too. I finally gave in in the late 90s to work on her's. I was deeply depressed, and she sensed it. And was doing whatever she could think of to bring me back. So she sent me on some quests. I have completed all but one. Find Sallie Hogg. I did, Finding her in a gedcom back when ancestry was free... well I thought I was going to stroke out when I did find her, my heart was literally beating out of my chest. Who was John Chesley Davis named for. ... That search resulted in hearing Mom's voice as if she were standing beside me, while in reality she was asleep in her room, deep in the throes of dementia. And I saw John Chesley Gerald flash in yellow neon. I went back and looked at the name later, it was J. C. Gerald. He was the husband of my ggm's sister. And the last may never be found... Sarah V. Fouche. The closest I've come to her is Jack Fouche in Grant County in 1870, not there in 1880. Which would fit the legend of her. Her mother died shortly after she was born and her fahter put her with a family and went back to France. Jack was from France. And she was supposed to be half Indian. Well, her husband's cousin went to Indian Territory OK and married a Foshee, who had a white father Little Foshee, and Creek wife. Some one either wrote or visited telling about some land, and Sam said, "They never cared about you before and you aren't taking anything from them now." I have tracked a Little Foshee thru several name changes, including Fouche. My aunt made a comment once about the amount of Jester info I had collected. I told her it was the differnce between having a rare name as opposed to having a common name like Davis, Morton or Thornton. I didn't have to prove my line to anyone's satisfaction but my own. Lynette, you embody the true spirit of the cloth (whatever that means)! What an impossible set of search criteria (to give it a name to give you more and more credit)! I'm guessing that your families were as gravel-hard and dust-gritty as my mother's lines, coming as they did from England and down the eastern seaboard for a while to angle down to the south and come out in Carrizo Springs, Dimmit Co., Texas. My cousin and I shared stories this morning, and it's no wonder we're survivors coming from a family of "hard-working for almost nothing pioneers." Yr story about your uncooperative relatives makes me feel I have a cousin in you. My sons too have no biological children, so there's no help there either. Your story about the yellow flash in neon--well I've had that happen in a lesser variation. So we really must be related. Ah well, so much for the flights of fancy fantasy and joy in them thar hills and the shifting sands of desert where my mother used to beg for a bump to appear on the horizon and created a yearning for days with clouds. OH Roberta, I have been threatening myself with writing a free space page on all the "wierd" things that have happened to me while researching. My eldest brother is the first of both lines to get a Ph.D. in social cultural anthro. In a straight line, father to son, He and my other brother were the first to serve in the armed forces of the established gov. Yes, we did have uncles who served in WW1 and WW2. Then comes me... an 8th grade drop out with a GED. Oh,Honey-Lynette, you are my mother's child!! and you are related to me--you're a writer, for heavens' sake!! Yes, please write your stories here so I can read them, absorb them and make myself happy from your fascinating work and ways you work and see! My father spent WWII in traction for sciatica, which totally kept him out of uniform. And a good thing that was, I tell you! He'd have been canon fodder right away--both my sons missed the draft and they are both dreamers. They'd've been killed too. We just aren't a warlike people this family. No Warrior gene here--though I've had to stand up for myself a lot in this crazy life. I don't have a link to it, but I watched an episode of "Bonanza" yesterday and enjoyed every minute. I still want to grow up to be little Joe. Very good selection this weekend, a lot of people forget the Temptations sang that song. Again very good selection this weekend. I'm a musician. I like the good stuff. Don't get me started on Madonna ! T&A bump grind grunt. NO talent ! I told you it was long ago--1973 or 1974, I think. The coffee place may not still be there, but it was right on the corner-the beginning of Hvitfeldt Street. There was a good bookstoren in the street too, but maybe it's gone too. Do you speak any Danish ? BOB, Is it [Vitfelt] but with some kind of very short outbreath for the H and a little heaviness for the d in dt? AND: With all those repeated names in that northern European nation, do you have famous folks in your history? I can read Danish OK if it's not too conversational, but that stød you have defeats my speaking and understanding. Swedish and Norwegian are a bit easier. There's no H in the pronunciation. It's more like vitt+felt. "white field". The parts of the family that spell it Huitfeldt seem to have more like 'wheat'+ felt, with the HW- like the folks who differentiate betweeh which and witch. Welcome everyone to the weekend chat. Also very interesting history everybody. Bob H: No, I didn't at all mean a H with a sound. Must have made first roll calls aloud by professors crazy. Used to lose stuff when I took it in for repair, or laundry went missing when they filed my name in some unknown system. Now we just use Whitefield for things like that. Once they finally found me in the I's under H.V. Itfelt! Hi hi that is funny, I was wondering about I saw your tree that there was no Danish relatives, but my husband are great with history he told me that Denmark and Norway was a union until they where separated 1814. So that make sense. National Centenarian’s Day is observed annually on September 22. National Centenarian’s Day is a day to honor those who are 100 years of age or older. The day was originally proclaimed as a time to listen to centenarian’s as they have so much rich history and wisdom to share. Nationally, a number of groups have been formed to honor our centenarians. Often, listening to their life stories proves the age-old saying that with age comes wisdom. HOW TO OBSERVE: Visit with a centenarian and tap into a wealth of knowledge, entertaining stories, and traditions from a time gone by. Use #CentenariansDay to post on social media. HISTORY: National Centenarian’s Day was established by Williamsport Nursing Home, Williamsport, MD. Do you have any "Centenarians" on your watchlist (from their date of birth to date of death.) How about living relatives like great grandparents etc... Maybe you would like to share with us??? I have one, Lucinda F. Coffey! "Lucy Coffey, 108 and the nation’s oldest living female military veteran, was honored in Washington DC July 25, 2014 along with other members of the "Austin Honor Flight" at Reagan National Airport and was welcomed to the White House by President Barack Obama and Vice President Joe Biden." Source: http://www.stripes.com/wac-legacy-honored-as-108-year-old-vet-lucy-coffey-fulfills-her-dream-1.295422 . Mary Solley-130 baptism ties in with alleged age - newspaper reports narrow down her actual birth date. I don't have any on my watch list, but there have been many individuals in my family who have lived into well their late 90's. I believe that we need to recognize and pay more attention to those who have lived to the age of 100. WOW Vincent, that is awesome!!! Thanks for sharing that!! Anyone else?? :) Thank you Michelle Wilkes for sharing your two centenarians as well!! I have one: https://www.wikitree.com/wiki/Davidson-5602. Dorothy June (Davidson) Armour was 103 when she passed away! Wow everyone and welcome everyone to the weekend chat. I hope everyone has a great source-a-thon. I will be travelling this weekend, but I will be rooting for a great event. My cats have been enjoying the deer lately. Wow they are so cute, thank you for sharing Doug. Wauw amazing Doug ..and this is what you see in your backyard ? 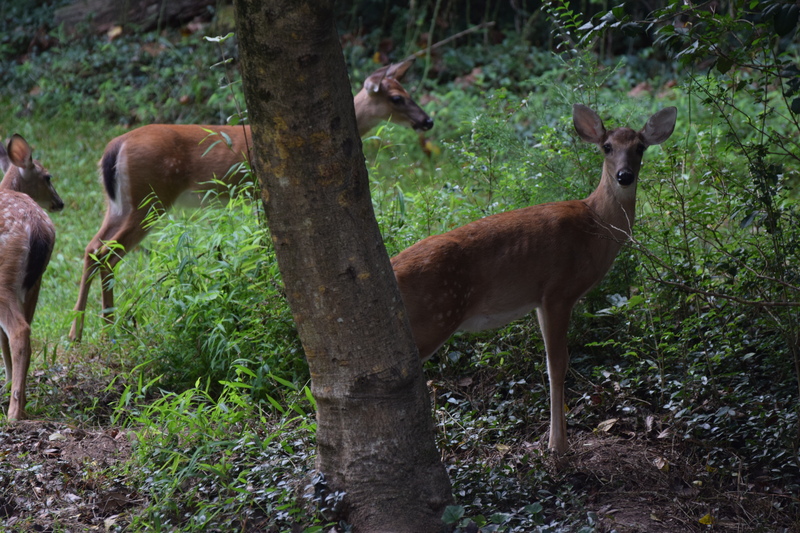 Havenʻt seen a deer lately, but remember watching the clever ones tip the bird feeder and steel the grain! Your deer look so content in the woods. Welcome everyone to the weekend chat and ditto to what everyone said especially to the pictures Doug. Time for frenzied packing moe this weekend - we move the following weekend (yes, the Source-a-Thon weekend!) I should hopefully still be able to participate a bit on the Saturday and Monday. Currently going through my Watchlist with the sorting feature enabled to show the profiles that had been edited the longest ago at the top. I'm sorry to say I found several from my initial Gedcom import that I hadn't gotten around to! I've cleaned several of them up, added some sources to others and some, alas, left me stumped as far as sources were concerned. I did have to put some Unsourced templates, mainly on some of the Quebec/Quebecois profiles due to there not being that many indexed/transcribed records to search through. I imagine the sources are there, they just need someone fluent in French to find them. On that note, managed to get help from several in the Quebecois project to accurately source some of my actual direct French Canadian ancestors (5xgreat grandparents, etc.) and connect them to other parts of WikiTree. A lot of them were sourced mainly from other trees to begin with (Gedcom initially came from Geni, and some of the further back profiles were not even entered by me initially), so it's nice to have actual records backing the connections up now! Taking a slight break from my Lapish One Name Study while I do this old profile clean-up project. I wish I could get one of my uncles or male-line cousins to take a Y-DNA test to try to get some context, though the surname itself is so uncommon I'm not quite sure if there'd be any hits. Good luck on the move, have done it way to many times. And it never gets easier. Welcome to the weekend chat and ditto to what everyone said especially Dean and I might be in that problem soon my self. Where in the World is Steve! So last week I promised to share some pictures from Bethlehem Pennsylvania. Some of them you may have seen parts of however I try to put up different views. This next picture is taken from the front of the Sands Casino the sign is hooked up to an old ore crane you can find a video of its glory days. This week sometime I plan to take a few snapshots from the main part of the city showing the Moravian College and the Bethlehem Hotel. Than will be moving back down to the Allentown area for some snapshots. Will see which ones I choose to share. Pictures look great...I hope you had a great time and were able to get some good information. I would love to walk in that cemetery. Can imagine the headstones and what they would tell, not just the words either - the design. Welcome everyone to the weekend chat. Steve I remember that first place and got pictures of it my self and also the Moravian College also. Ditto to what Dean said and to everyone. I plan to keep working on some very messed up Boone profiles. I am talking about some that are attached to the wrong parent, have one or both birth or death dates wrong. There are a lot of them and even without having the unsourced template on them most do not have sources either so between researching those, keeping an eye out for changes due to the source a thon and listening for the emergency net traffic for the hurricane that just hit Puerto Rico hard it is going to be a very busy weekend. The good news is our weather here is going to feel like summer for the entire weekend and they finally put the gutters up on our place today. Good luck on the Boone profiles. Sounds like you have your work cut out for yourself. I spent about 2 days a couple of weeks ago and at least identified some of the "problem branches"....thanks for taking over! For the first 50+ years of my life I was a descendant of Daniel Boone. Then my 2nd cousin in Texas, the one with a PhD, found that we were really descendants of someone called Boon. Disillusioned! Still, my ancestors were slowly moving west and into their future when Olʻ Daniel was shooting "bars" in the wilderness, so I do come from hearty pioneer stock. Kristina, I am not a descendant of Daniel Boone but the lines I do descend from claim a blood relationship to him as early as 1800. I have also found records for them that sometimes spell the name Boon. The people recording the early records were not always the best at spelling and sometimes wrote what they thought was right. Welcome everyone to the weekend chat. Dale I have heard that a am a descendant of Davy Crockett and President Andrew Johnson too. Ditto to what everyone said. Well my first major news is that I was picked to be the Member of the Week on Tuesday. I have been busy checking my connections to many famous people!! Haven't had my weekly family chat yet - got another 2 hours still to wait. I am working on a new notable whose family tree is not yet online. I'd like to get it up this weekend, when I am not doing the Saturday sourcing, and hopefully get it connected to the global tree. this one involves immigration from Italy, so I have to deal with a change of name as well. I love a good challenge!! I also made contact with an American retiree this week who is related to Mona Anderson - the Kiwi author whose tree I posted on wikitree several weeks ago. I was curious as to how and why a person of NZ ancestry would be living in the USA. Her father was a University lecturer and he was hired by the UBC in Vancouver, Canada. She was born in San Francisco. Mona's first book (originally published in 1963) was finally released on line on Tuesday so I purchased it and read it. I have been waiting for years to read this book!! My Kiwi Crew team are gearing up to work on the source-a-thon next weekend. The lists have been released today, but they may need to be amended and updated before next weekend. Finally - I am curious. Will someone still be hosting the weekend chat next weekend while the source-a-thon is happening? Robynne, Congratulations on being selected as the Member of the Week!!! That is such a great honor. Also, good luck during the Source-A-Thon. Congratulations on Member of the Week!! Dont worry, Bea, the first thing I did on Tuesday was to save screen shots of all those connections!!!! As many as I could think of. And I am still thinking of more!!! Welcome everyone to weekend chat. Yes congrulations Robynne and ditto to what everyone said. A fairly run of the mill week. Just busy with the usual activities. went dancing on Monday afternoon, enjoy that alot. Something I only started in my 50s and wish i had learnt earlier in my life. I only got to learn ballroom & latin dancing as I go on cruise ships and it is a big part of onboard life. i was only going to do one cruise, when i was 50 and lo and behold been hooked on cruising since. Found some time to get to the library to access Ancestry and Findmypast. and check out some "info". Have been adding another local Brightlingsea family the "Francis" family to Wikitree. i already had a few members there but have added to this and expect to add more in due course. I have become very interested n my Brightlingsea connections as it is people I readily relate to. Welcome everyone to the weekend chat. https://www.dropbox.com/sh/rqo8mt2eobujwgd/AAAzB3IGNHqNKXBfdE985NBZa?dl=0  a docx and pdf of the puzzle are located at this link. Thank you Laura for the wonderful work, words and great puzzles, will sure try my best on this one, South Africa has a special place in my heart, found a cousin trough WikiTree who just a few weeks ago send me some wonderful presents and love the wonderful South African project teams and members, they are really awesome. Bea I love working on these because I learn so much about all of the really wonderful projects available here on WikiTree. So glad you found a relative there. It is truly a small world... I love the fact that everyday I get to talk via email with people all over the world. And many of them are my cousins! Enjoy your Heritage on South African Heritage Day! Welcome everyone to the weekend chat. Ditto to what everyone said. Hope the sick baby is feeling better. Thank you Laura and best wishes and hugs for the little one, our first grandchild was born 1 September and we have five children, I know the feeling, we often are worried sick about them when they are so little eeh. OMG, Laura! How did you dream that one up? Roberta I try to read up on each project and find something that I think will not only be fun for the weekend chat participants but teach something about the project and highlight the hard work each project is doing. The sub projects seems to be a perfect too for that! Today in New Zealand it is Election day in which who will be the 41st Prime Minister of our nation. It's been the most interesting election in a long time, Richard. Today feels so quiet after weeks of red and blue (and green and black, never mind the minor, minor parties). I just hope New Zealand is the long-term winner! Just finished my chat with my mother and my sister. My mother did her voting during the week. My sister is about to go out and vote today (Saturday in NZ). I didnt bother to ask who they would vote for. I will ask them next week if they voted for whomever wins or not. For me personally, even though I cant vote, I hope Labour wins and Jacinta becomes the new PM. Great work on the connection of Richard Attenborough, Richard. It's been a wet week, but the forecast is for unseasonal very hot weather in the next few days. On wikitree, I connected a family member to one of Robynne's profiles. I'm going to have a look to see if I can find a newspaper inquest report to add to the story over the weekend. This week is the ninth anniversary of life changing surgery. I'm so glad to be still "up and running"- well, not quite running, but not in a wheelchair, which was a possible outcome. I thank my ancestors for providing me with wonderful role models of how to make the best out of adversity. They've kept me sane. Dont forget to vote today, if you have not done so already. Hi Fiona, It was a hot day here in Texas today (upper 90's) with bright sunshine. Sounds like you have made a remarkable recovery from your surgery. Best of luck with finding the newspaper inquest report for the profile. I voted last Tuesday which was Suffrage Day - the day women first got the vote in NZ. The profile I connected to was one you created from the Rebecca Gibney WDYTYA programme. His wife, Olive, appears to be my second cousin twice removed! She is Lovell-1900 who connects to you through the Boyes, Cooper and Franklin families. It's a small world. Sadly, I couldn't find the inquest report for John Way, but that's probably because he died two days after the accident so the cause of death would have been established. Cool. So now you can say that the actress Rebecca Gibney is a distant relative of yours!! I was telling my sister in our weekly Skype chat today that we are just 17 degrees from Queen Elizabeth. She is very impressed. She loves that 6 degrees of Kevin Bacon thingy and while we are currently 20 + degrees from Kevin, we are LESS than 20 degrees from the Queen!! I have a 3rd cousin who is a 6th cousin to Princess Diana!! Thanks for your kind comment. I'm actually in New Zealand and compared to what I see of the US, we are generally blessed with quality fresh food which does aid wellbeing. There is still a strong culture of growing and preparing fresh food and eating at home. We're also lucky to still have a public funded health system, which, while not perfect, does kick in during emergencies. The surgery and aftercare I had would have cost several hundred thousand dollars in the US. Hi again, Fiona, I'm so grateful for your notes. I dearly loved New Zealand, where I visited in my late 40s to visit a couple (both PhDs) in Auckland, with two girls. The place is like a living magical mystery tour for me, except my son, then about 11, went vegetarian after seeing so many trucks loaded with denuded sheep carcasses (our view from the top of a double decker). It took a doctor, years later, to get him back to eating animal protein. Yes, it was a beautiful couple of weeks and a long painful air-ride to get there, or else I'd have returned several times by now, and for purposes of survival always adding a stop for a couple of days in Hawaii, and on the other end, somewhere, some island, of reasonable distance from where you are. We traveled north to a sheep farm, south to Rotorurah(correct spelling), and nearby to a chamber concert in a country home. Fascinating trees, streams, Carved buildings, and the beauty of the green hills dotted with happy feeding sheep, so white, with the oceans nearby when one looked for them. Would you know, Fi, about how I can get an inquest report for a relative who died in the apartment of her lover and father of at least two of their children? in Germany, in the early 1800s, I think? He took care of her while she was ill or recovering from an accident.He lived just a few doors down from her apartment. I think he was married. His name was Franz Metzger and hers was Christina von Berg (or Berg with a middle name of Paulina) in Karlsruhe, DE. I'm so pleased you had a nice time in New Zealand. I imagine sheep carcasses would be very confronting for a child who has never seen them before. We had a lifestyle block with animals, and I must admit, I was uncomfortable with eating our own animals and even now don't eat a lot of meat. On inquest reports - a lot of the early NZ ones were reported in the newspapers, so I had thought that as I had the date, I might have been able to find one. Here, the modern one are held in National Archives which is searchable. I have no idea how you would find a German one, but perhaps a question on G2G might be a starting point?? After being away, I came back this week and found a lot of new things about Wikitree. This week has been a learning process. And I am getting ready for the Weekend-Source-Sprint and for next week Source-A-Thon. Welcome back, Guy. Yes, there has been a lot of changes for the better recently. A lot has changed with the Greeters and the GEDCOM's. Welcome back Guy we sure missed you around here, and yes things keep changing and improving (we hope) eeh. Have fun and good luck next weekend ! 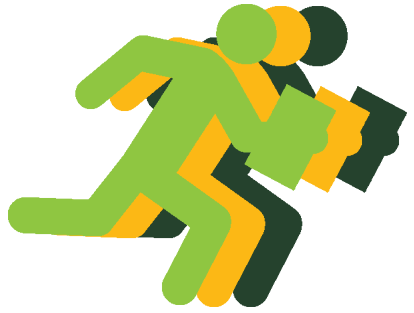 If you have register for the September 2017 Source a thon but haven't chose a team look at this page and if your are interested to join us leave a comment on the page with your bib number, your whole name, profile ID number, also your email address so you can be your own profile manager on this. Or you could email me this information to me at Linda Barnett llb_1@charter.net. If you want to register even go to the https://www.wikitree.com/g2g/462656/will-you-participate-the-source-thon-current-registrations?start=40#a_list_title to register. Then ask to be on Team Tennessee we still have room for you. Did you know there's a new Source-a-Thon 2017 (first register here) organized for 30 September -2 October 2017 ? A huge event, to keep things organized we are going to work with teams again, since you're a member of our Project, perhaps you would like to join our Team Tennessee Team to help and source and improve Unsourced Tennessee profiles ? WikiTree profile: Space:Team_Tennessee_2017_September_Source_A_Thon and follow the instructions above. We would love to have you on the team. So that what I have been up to this weekend. I will be part of the Mighty Maple Leaves .... from Canada and will work on what I know best... French canadian profiles. What a day. Unpleasant people at my neighborhood social media site, holding a bickerfest about whether it's legal to shoot (at targets) on our property. At one end of the bell curve, a lady who knows it's legal because she has lived up here 37 years. At the other end, a guy who quoted the county ordinance that forbids it. You would think the guy on the right hand tail of the curve would have ended the argument, but no. Facts no longer matter (except at WikiTree!). Inconsiderate people at the supermarket (including an employee). Unpleasant inconsiderate people on the roads. I feel extremely relieved to have arrived home safe without hurting anyone or doing anything to get thrown in jail. OK enough of that. Time to relax. I got an e-mail saying his Dad matched to my DNA at GEDMatch. I didn't recognize a single name in his tree, so I suggested the connection might be one of my brick wall gggps. Maybe that will result in a wall coming down from the other side. That would be too cool! That's my story for this week. My old dog and I are gonna lurk around for a while and start enjoying our weekend. Hope y'all do, too! I agree times have changed and people can be rude and argumentive. But at WikiTree we all collaborate and do our best to be nice to each other. Be careful lurking you might get thrown in jail (just tell them the old dog did it!) or worse one of the target shooters might miss the target. Herbert, sorry to hear about all of your fun. It sure does make for a long day when you have to deal with rude people. David is right times have changed and that is why I would love to find a place to just go hide. Only come out when I need something, as long as I have internet to keep doing WikiTree to stay busy I will do just fine. Thanks, guys. I knew better than to look at the neighborhood shooting thread, but I did it anyway. As for the rest, I suppose there is a lot to be edgy about these days: disasters, wars, civil unrest, etc. Dean, I hear ya. My home is actually very much a hideaway kind of place. As a self-employed person, I don't have to work with anyone with whom I don't get along, and vice versa. I try to do my commuting and shopping during less busy hours, it just didn't work out this week. Happy weekend everyone. 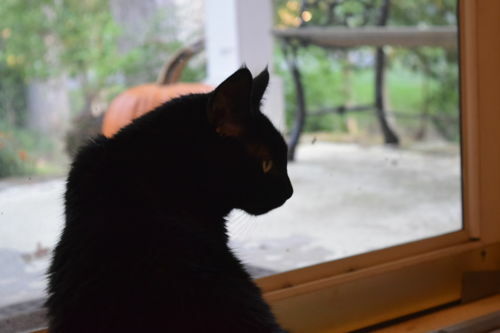 It's been an uneventful week here, with nice fall weather. This week I discovered that a friend who I had lost touch with is one of the officers of the local genealogy club. I might attend the next meeting, if my current health issues allow. So even though I'm a WikiTree newbie, I figured it would be a good learning experience to participate in the Source-A-Thon. I'm looking forward to it. I was perusing some of the unsourced profiles. Wow! Those were pretty amazing people born in Iowa in the 1600s and 1700s! Here's a thought for the week: How many times have you written last year as the date in January? I found both a state death record and headstone engraving for 1894. There were several newspaper articles about his accident, thrown from a wagon on Tuesday, Jan 8, 1895. Best of luck with your first Source-a-Thon. Yes, one can find some unexpected facts at times while sourcing a profile. You have to take headstones with a grain of salt. Both the headstone and the death certificate of one of my great-grandmothers (Pendergrass-249) say she was born in 1852 but she was in the 1850 census as a two-year-old! Two in 1850 = 1852. Or maybe 925. Great grandma lied about her age so great grandpa thought he snagged a young bride. My grandma did that - but someone caught it - like when she wanted to be eligible for social security. I always thought Aunt Marian lied about her age so she would be younger than Uncle Fritz. Her baby spoon was engraved '96 but she was born in 1902. I found the answer in the 1900 census, where her mother was married in 1895 and was the mother of 3 children, 1 living (Uncle Warren). Welcome everyone to the weekend chat and thanks for the interesting stories. First week of my new full time job.... worn out! My feet and lower back are killing me! LOL The only part I liked the most that was new was working with the tube system in the hospital. Hoping it doesn't wear me out too bad before the SAT next weekend. Amazing Charlotte, love the team shirts that's so cool, have a wonderful Sunday ! Welcome everyone to the weekend chat. The shirts are very pretty. People are on edge and touchy (something Herb ran into in his neck of the woods too). Our city is in turmoil and it is very sad. Several members of my family have been sick and I have been taking care of them or children as a result. Which is ok but not planned. I have put Halloween treat bags together for my 2 granddaughters who are getting them this weekend so they have some time to wear the Halloween festive clothing. Oct is coming fast and this is a fun time of year. I am working on a different kind of puzzle for Halloween weekend. I had a contingent of wonderful women at my home on Monday night and we had fun.. it was a great start to a week that went off kilter after that great start. I cooked up a storm and we have had left overs in one form or another since. Having another party this time on Sunday to celebrate my daughterinlaw's and husband's birthdays. Fun for the whole family who hopefully are all well by then. Medicines seem to be kicking in and the adults are on the mend.The baby at 6 months yesterday just knows she does not feel right and it throws her off. She just wants to be snuggled and rocked and coddled. She slept in my arms a lot today but that locked me in place. So I got nothing done but that is OK, she is worth it! No temp but congestion. Could be allergies. But the little ones don't eat well or sleep well when congested. Vaporizers do help. She did get better later in the day in my filtered house so it could very well be allergies. Tomorrow I do a Farmer's Market. These are coming to a close soon. But it gives me direct contact with people and I get lots of ideas from that one on one interaction with retail side clients. I have done virtually nothing with genealogy this week. I hope to get something done tomorrow night... I am itching to get some new finds for my family into WikiTree! Hope everyone has a great weekend and looking forward to hopefully more normalcy next week! Sounds like you have had a very busy week, with no relief coming soon. You need to make sure you take some "me time" soon. Have a good weekend and enjoy the family. Thanks Dean. I am hoping for a return to more normalcy in the near future. Hi Laura, Hope all get well soon and you get some rest and back to doing your WikiTree stuff. Have a great October and fun at the birthday party.